Optimal working dilutions should be determined experimentally by the investigator. Suggested starting dilutions are as follows: WB (1:500-1:2000), IHC-P (1:100-1:300), ELISA (1:20000). Not yet tested in other applications. Fig.1. Immunofluorescence analysis of human breast cancer tissue. 1, IL-8 Polyclonal Antibody (red) was diluted at 1:200 (4°C, overnight). 2, Cy3 Labeled secondary antibody was diluted at 1:300 (room temperature, 50min). 3, Picture B: DAPI (blue) 10min. Picture A: Target. Picture B: DAPI. Picture C: merge of A+B. Fig.2. 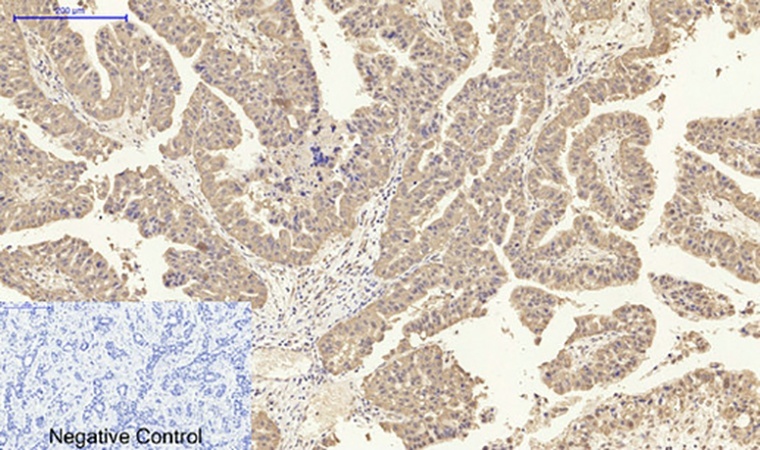 Immunohistochemical analysis of paraffin-embedded human liver cancer tissue. 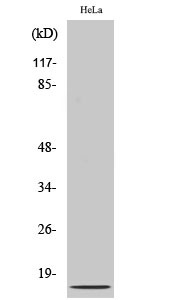 1, IL-8 Polyclonal Antibody was diluted at 1:200 (4°C, overnight). 2, Sodium citrate pH 6.0 was used for antibody retrieval (>98°C, 20min). 3, secondary antibody was diluted at 1:200 (room temperature, 30min). Negative control was used by secondary antibody only. Fig.3. 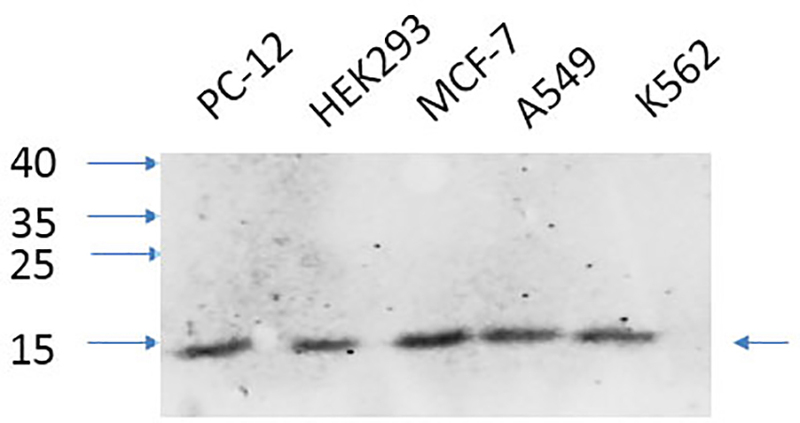 Western Blot analysis of PC-12 (1), HEK293 (2), MCF-7 (3), A549 (4), K562 (5), diluted at 1:1000. PBS containing 50% Glycerol, 0.5% BSA and 0.02% Sodium Azide. Stable for one year at -20°C from date of shipment. For maximum recovery of product, centrifuge the original vial after thawing and prior to removing the cap. Aliquot to avoid repeated freezing and thawing. Gel pack with blue ice. The product listed herein is for research use only and is not intended for use in human or clinical diagnosis. Suggested applications of our products are not recommendations to use our products in violation of any patent or as a license. We cannot be responsible for patent infringements or other violations that may occur with the use of this product. Interleukin-8 encoded by CXCL8 is a member of the CXC chemokine family. This chemokine is one of the major mediators of the inflammatory response. This chemokine is secreted by several cell types. It functions as a chemoattractant, and is also a potent angiogenic factor. This gene is believed to play a role in the pathogenesis of bronchiolitis, a common respiratory tract disease caused by viral infection. This gene and other ten members of the CXC chemokine gene family form a chemokine gene cluster in a region mapped to chromosome 4q. IL-8 Polyclonal Antibody detects endogenous levels of IL-8 protein. Here we provide some standard research protocols for bioscience including molecular biology, cell biology, immunology, plant biology, genetics, etc. To our knowledge, customized protocols are not required for most products. So please try the standard protocols listed below and let us know how you get on. Biochemical reagents have been widely used in life science fundamental research as buffer, probes, substrates, intermediates and standards, etc. You may optimize or choose proper protocols for your specific assay. However, some of tips and suggestions listed below may be for your reference. ♦ What and how to make a "good" buffer? Antibodies are useful not only to detect specific biomolecules but also to measure changes in their level and specificity of modification by processes such as phosphorylation, methylation, or glycosylation. Here show some protocols and troubleshooting tips on how to get the best from our antibodies. Synthetic peptides, native or recombinant proteins can be used for medical, academic and research purposes, such as gene therapy, drug screening, antibody production, cell function analysis. Here, we provide some of tips and suggestions for your reference. Assay kits that are simple and convenient to use, which are superior in performance and require little to no time for assay optimization. Further details of specific products which are needed for individual protocols are given in the protocols themselves in booklet. We hope this will be helpful for your research work. Please let us know through support@abbkine.com if you need more information or support.